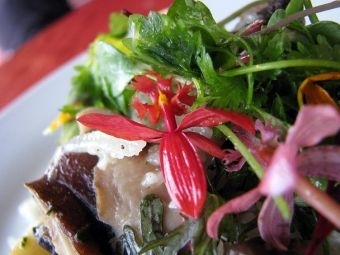 On this week’s Vermont Garden Journal, Charlie profiles edible flowers. There are many varieties to choose from that are good for salads, drinks, stir fries, soups and desserts. Charlie delves into the history of edible blossoms and discusses the best methods for preparing floral foods. Tune in Friday evening and Saturday morning for more about edible flowers on the Vermont Garden Journal. Have you got gardening questions? This Friday, Charlie joins Vermont Edition at noon, and will be sticking around to answer your questions. To ask Charlie your question during a live Q & A session, log on to the Vermont Garden Journal Facebook page Friday after Vermont Edition. I’m Charlie Nardozzi and this is the Vermont Garden Journal. When someone sees a garden loaded with daylilies, roses, and calendula, they admire it for its beauty. To me, it’s lunch. There are a number of delicious edible flowers available to add to salads, drinks, stir fries, soups and desserts. Many gardeners are familiar with the more common ones, such as daylilies and pansies. However, there are many others that can make your summer meal a visual and culinary feast. Edible flowers is not a new invention. Humans have been eating flowers for thousands of years. Capers, the flower bud of a Mediterranean evergreen shrub, has been used in cooking for over 2 thousand years. Daylily buds have been popular in Asian cuisine for centuries. Dandelion was referred to as the bitter herb in the Bible. The Romans loved mallow and rose flowers. But not all flowers are edible, so it’s important to properly identify what flower you’re eating and not eat any flowers that have been sprayed with pesticides. Also, not all parts of flowers have a good taste. For example, on calendula, carnation, marigold, rose, and chrysanthemum flowers only the petals are edible. The flower base has a bitter flavor and will make the novice flower eater cringe. Remove the pistils and stamens from flowers to avoid eating pollen, especially if you are allergic to it. Harvest flowers when they’re just opened in the morning after the dew has dried for the best flavor. So, what to do with an edible flower? Well, here are some ideas. Stuff some squash blossoms, crystallize pansies for cakes, sprinkle rosemary flowers in muffins, or grill salmon with nasturtium flowers. How about floating borage flowers in lemonade, or a gin and tonic, for a refreshing mid summer drink. Now for this week’s tip, now is the time to start your fall veggie garden. Consider making space for a fall crop of carrots, peas, beets, and greens. Protect young seedlings from insects with a floating row cover. Next week on the Vermont Garden Journal, I’ll be talking about the shrub, summer sweet. For now, I’ll be seeing you in the garden! Why are more and more people suffering from allergies? Charlie Nardozzi says there’s more pollen in the air than ever before. This week on the Vermont Garden Journal, he’ll explain why that is and what you can do about it.